* 2010 Professor Gunapala Malalasekara Memorial Award for life-time achievement of Buddhist literary contribution. * 2005 Ogha Tharanaya. Best Sinhala Poetry. State Literary Award. * 2004 Chaya Pranthaya. 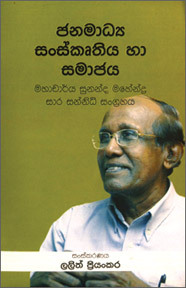 Best Sinhala Novel. Godage Literary Award. *2002 Niruwath Devivaru. Best Sinhala Novel. State Literary Award. * 2001 Janakiyaman Potha Best Research Work. State Literary Award. * 1990 Most outstanding Citizen Award. Lions International. * 1964 Hevaneli Eda Minissu Best Sinhala Novel. State Literary Award. * First novel Hevaneli Eda Minissu wins a State Literary Award in 1964. * Drops his family name ‘de Mel’, switching to middle name ‘Mahendra’ at the BBC. It turned out to be a wide path, roughened and smoothened by his seniors. He tried his hand in almost everything you name in Sri Lankan art. Sunanda Mahendra’s calibre is such. Creativity pervaded his life with an unsurpassable halo: broadcaster, poet, novelist, short story writer, playwright and director, university teacher, lexicographer, administrator and so on. If he is to be called versatility, Professor Mahendra deserves it more than anyone else. He first set a record by winning a State Literary Award for his maiden novel Hevaneli Eda Minissu in 1964 – being only 26 years of age. The novel was adapted into a film later on by Parakrama de Silva. Both Ediriweera Sarachchandra and G B Senanayaka praised the novel, which was urged to be published by late dramatist Sugathapala de Silva. Mahendra has a difference compared with most of the scholars who fled to England for higher studies. He was not on a scholarship, but was representing the then Radio Ceylon at the BBC World Service on contract basis. While other university scholars eked out their scholarship funds, Mahendra had a comfortable life with most of his expenses settled by the BBC. But this only encouraged him to work on his doctorate. Luckily he had a wise company of the likes of Sarachchandra. Many troubles came his way. His contract was up, and there were people petitioning the Lankan government not to extend his stay in the Britain. He nevertheless weathered all the storms. This academic urge remained faithful all his life. That’s why he stands aloof among his contemporaries. He came back to Sri Lanka adorned with a PhD, and soon joined the Kelaniya University’s Mass Communication Department. He is among the the few pioneers of the Mass Communication Department. Then started his two-fold life: creative and academic. He represented Sri Lanka a number of times as a communication scholar. His stage plays Jana Hathura, Socrates, Chekhov Sandyava and Aesop come to life as academic projects. His masterpiece Socrates won eight awards. He pictured Socrates through Plato’s Last Days of Socrates and Aristophanes’ The Clouds. Before writing the script Mahendra studied both these works closely. He tried to maintain an experimental rhythm throughout the play, analyzing the man called Socrates, his real expressions, his punishment, the way he face it and how would a society respond in such a situation. 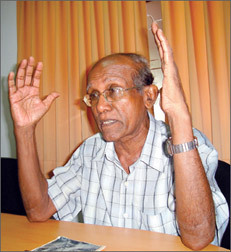 Mahendra reached the pinnacle of his university career becoming the first Mass Communication Professor in Sri Lanka. Among his students are professors Ariyaratne Atugala, Rohana Luxman Piyadasa and Chandrasiri Rajapaksa. He belongs to the generation of bilinguals. With his good command of both English and Sinhala, professor Mahendra has been guiding the younger generation. He always opined that English should be learned to deliver the local tradition to the world and vice versa. If someone like Sunanda were born in another country, he would already have been chronicled into a biography. Mass Communication Department published a felicitation volume in honour of him. But that contains only a little information about him. Lalith Priyankara’s attempt is a further step. Lalith’s work, though not a complete biography, tells the story of Sunanda in others’ words. These ‘others’ represent some fields he has been contributing to over time: Aruna Lokuliyana on his university life, Karunaratne Amarasinghe on his radio career and Lucien Bulatsinhala on his stage plays. Ravindu Mahendra’s essay on his father, though brief, is enthralling. Lalith’s work should be appreciated as an effort to give out a speck of a genius life. Sunanda Mahendra is a rare scholar with vast versatility, which is why his life and times should be chronicled to inspire our posterity. While we thank Mass Communication Department first, and Lalith Priyankara secondly for his single-handed effort on a further step, we still believe a proper complete biography of Professor Sunanda Mahendra is the need of the hour.